A decade ago, I was part of a team developing a Strategic Public Transport Network Plan for Australia’s national capital, Canberra. It gave rise to this thinkpiece about long term public transport planning in general. A key idea was to have a citywide network of Rapid buses, with widely spaced stops. Our most ambitious map (below, click to enlarge) imagined four of them, shown in red, though only the two longest ones were to be implemented anytime in the near future. We also proposed a local frequent network (orange) covering most of the city. We stopped there because we wanted the plan to seem financially reasonable. Still, we were clear at the time that we were creating a structure for growth. We were not predicting what would happen in what year, but rather defining a network of services that would phase in as development and political support warranted. When a transit idea catches on locally, everyone wants it, so the next stage is often to deploy it beyond the range of where it can really succeed. So I wouldn’t be surprised to see this network pruned as ridership numbers come in, especially if times get leaner. But meanwhile, the lesson is that great planning can lead to more money, if it starts to build a vision that people care about. I don’t regret the fact that our plan’s vision, prepared 10 years ago, was more limited. At that time, a more abundant plan would have seemed delusional. You walk before you run, as they say. We were walking 10 years ago. Now Canberra is running. Public transport is the global term for what North Americans call transit. I tend to use the word appropriate to the place I’m talking about, but I hope everyone understands it on both sides of North America’s moat. 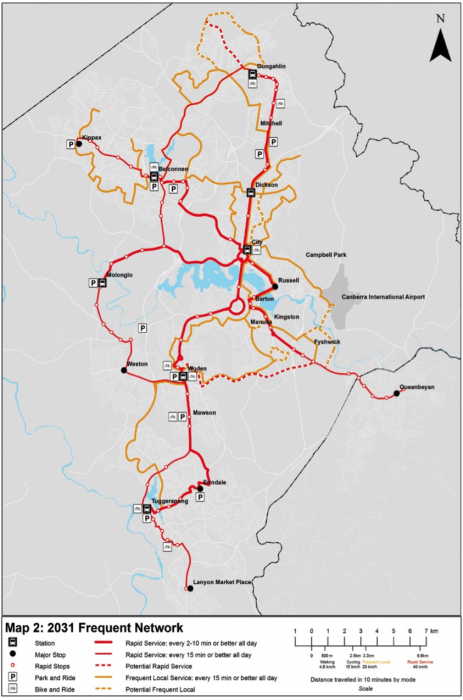 One of my concerns in strategic planning is to propose only a few corridors of high-level transit in the early years, so that there’s a motive for development to concentrate on them. This effect is lost if that network goes too many places, relative to the demand for development. The result is likely to be a more sprawling city. But there isn’t such a word. So when I’m working in a city where the short-term reality is an all-bus system, and I talk about that system and our short-term plans for it, well, it’s really hard not to use the word bus. When I want to help people visualize it, it’s hard not to draw a picture of a bus. Although Mr Walker proclaims transport mode agnosticism, he is being paid by a pro-bus department … . What do you think would happen to future work for his firm if he came out and said, replace buses with light rail on the rapid route where the demand warrants this modal change. 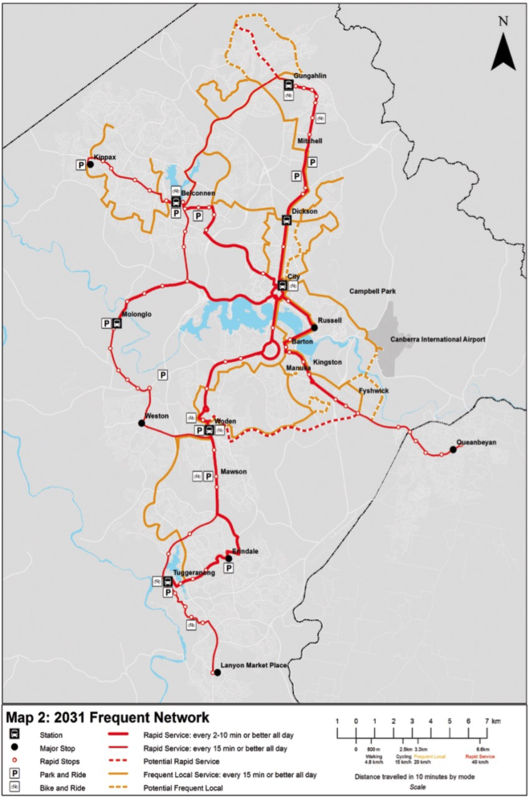 I have heard the [local government] policy people report on their long term plans based on the ‘Canberra Transport Plan’. They only refer to buses. Actually, I’m being paid (and modestly) by a department that’s trying to plot a rational course into a sustainable transport future, for a city of 345,000 people who live mostly at low densities with an abundant road network. The transit system is not yet at a scale or intensity where it needs the capacity that light rail would offer, nor is there much near-term prospect of funding for it. 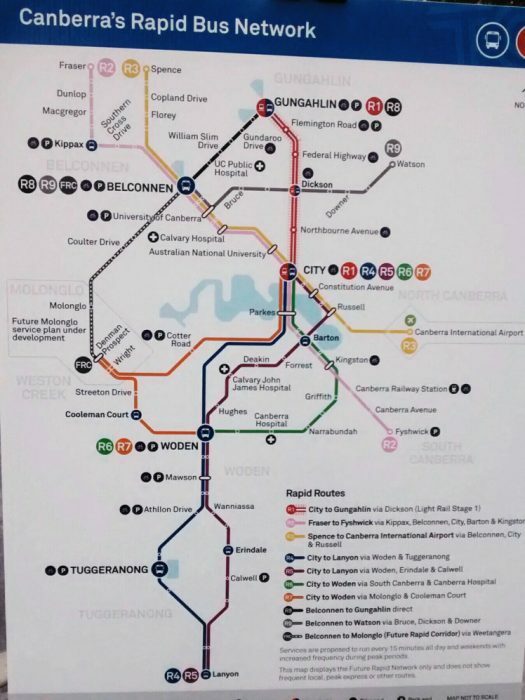 Light rail could happen, and I certainly don’t oppose it, but as I said over and over in Canberra’s Strategic Plan process, if you wait for light rail, you will miss a lot of other opportunities to improve transit mobility, and to encourage more transit-friendly urban form. So to improve public transit in Canberra, the government is moving forward with a plan to improve the buses. Not because they love buses, but because (a) they have buses and (b) they need to move forward. And so, to talk about that, they need to say the word “bus” a lot, and even draw pictures of buses. Yes, if your conception of transit begins with an absolute division between a bus world and a rail world, then officials who do that are going to sound to you like bus advocates. But if you call them that, you’re projecting your scheme onto them. Not everyone lives in a bus-vs-rail world. The experts and officials who say bus a lot may well be true bus enthusiasts, but they may also be people like me who just want to get on with the work of developing good transit, and who therefore reach for whatever tool will best do the job at hand. Why are pedestrian streets in commercial areas so common and successful in Europe, but not in North America? And why does a downtown core as densely populated as Vancouver only have one temporary pedestrian area (part of Granville Street)? And could Vancouver make the main shopping street (Robson Street) a pedestrian corridor like many UK towns and cities do (such as Birmingham, Glasgow, Reading, Bournemouth, and many more)? I note you commented on Price Tags about Granville Mall earlier this year, and Price Tags has a recent article on the removal of a pedestrian area in Raleigh, North Carolina. Have you any further thoughts on these issues? 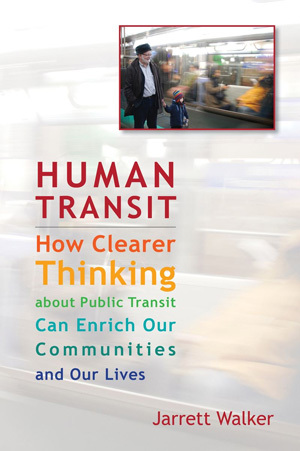 How should environmentalists engage with long-range transit planning studies? What should you focus on? What should you object to?